The first three of these shots were taken at my last high school band concert, a few days before graduation, performing in the amphitheater in beautiful Gilson Park, right by Lake Michigan. These pictures are admittedly not very good. They are very old and blurry. 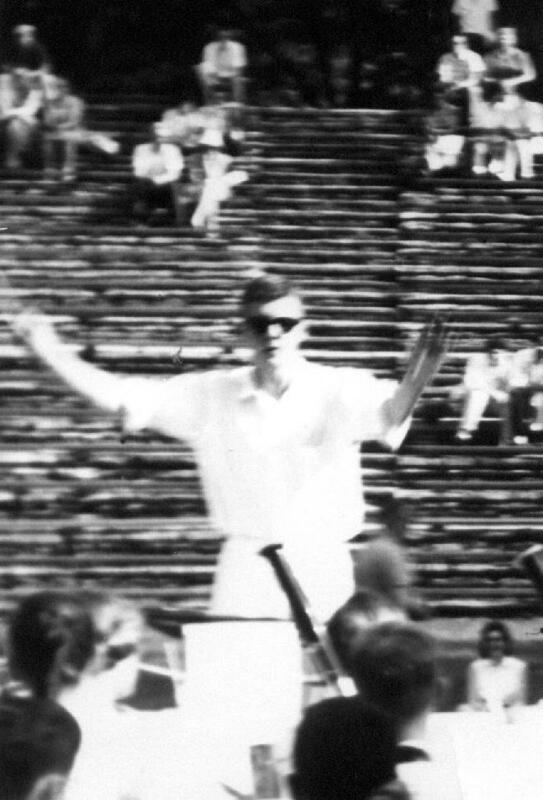 I don't know who the cameraman was, but I suspect it was my father who snuck around to the back of the band in performance to get the conducting shots. 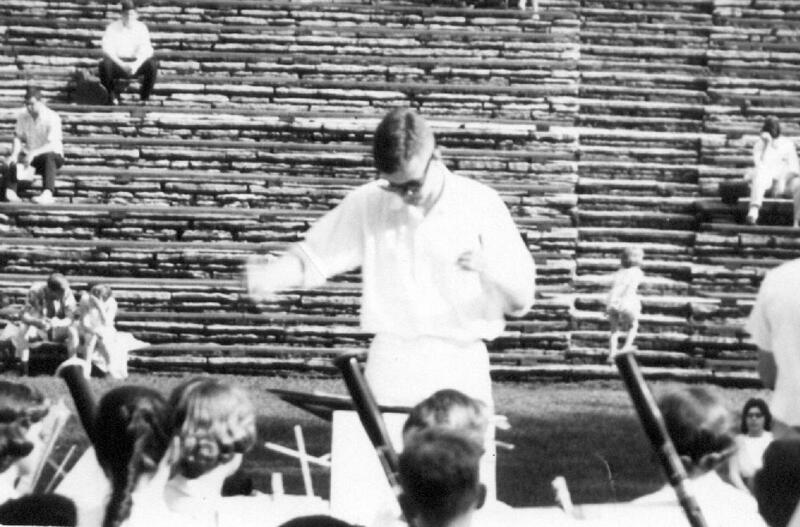 I no longer remember what I was conducting. As you can see, the concert was not exactly standing room only. I remember it was a hot day. This picture is a tad sharper, but I'm looking down at the score. 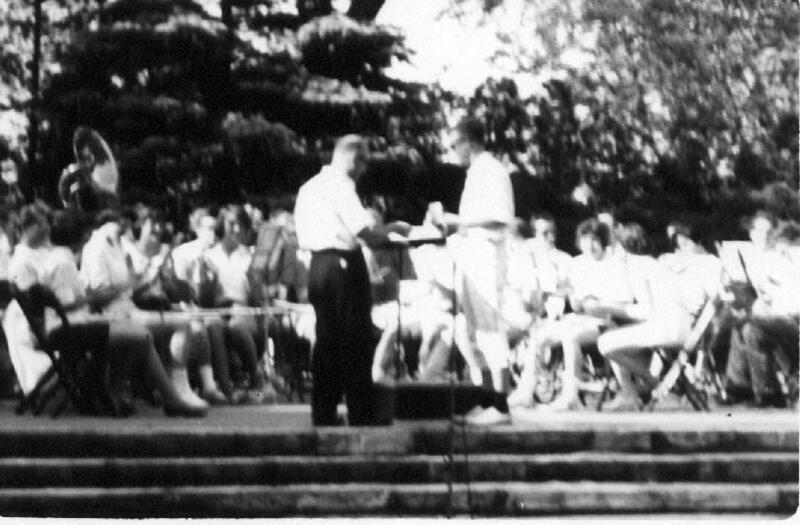 Here I am receiving the annual Arian Award from Mr. Mages, a student-voted prize for outstanding band member, for which I got bragging rights and my name engraved on a plaque that hung in the band and orchestra room. Also, I got some sort of medal that my mother kept on a shelf full of knick-knacks, since I had no use for it. The award was clearly not given for best dressed student. Notice that I'm wearing pedal pushers (popular in the era), and black socks with white sneakers. In my high school days I had a reputation for wearing sun glasses even indoors, just to look cool. They let me get away with it. The flutist on the outside, with the black shorts and her leg extended, is Janet Sundberg, a wonderfully talented musician, and my girl friend at the time. It was Janet for whom I wrote the piece Study in Violet , just a few weeks after this photograph was taken. Me acting the part of drum major. I believe I got the job because the uniform fit. There was only one. My geek suit. This was probably taken on Memorial Day a week or so before the concert pictures above. I'm standing in front of our house. There was an annual Memorial Day parade that passed right by the house every year, and that ended in that amphitheater in Gilson Park. I can't remember that I ever got to see it myself, because I was always marching in it, either in Cub Scouts, Boy Scouts, or a band.